Remember phone booths? Remember having to call your parents collect to come pick you up after track practice in high school because you couldn’t scrape together two gum-encrusted dimes from the bottom of your backpack? 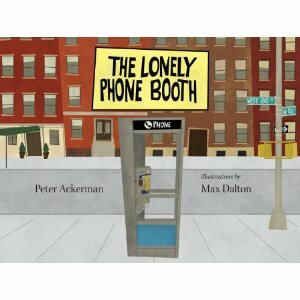 Maybe that was just me…but for anyone who does remember the antiquated charm of the phone booth, Peter Ackerman’s adorable “The Lonely Phone Booth” is a treat. On a busy corner of New York City, sits a little phone booth who’s feeling rather neglected, what with all the cell phones he sees rushing by. But, could he find new life once an electrical storm renders the cell phone towers defunct? This story has a retro feel and rallies support for the little booth as city officials threaten to haul it off to the dump. The pairing of Peter Ackerman’s delightful prose with Max Dalton’s illustrations is a smart one. Ackerman, a playwright who wrote Things You Shouldn’t Say Past Midnight,imbues an obvious love for New York City and the symbols of its glory (ballerinas, businessmen, racing cabs, skyscrapers) and Dalton, Argentinian-based illustrator extraordinaire has long been a favorite ever since he designed a “Ferris Bueller’s Day Off Board Game.” Put these two together and you’ve got a winning combination that will have children cheering for the booth. And you’ll recall with warm memories when you used to close that folding door behind you and call home collect.